Many active people these days have heard about orthotics because they have become an increasingly common treatment for a wide range of foot problems. Orthotics are scientifically designed devices that fit each patient’s foot to provide relief. Here’s just a partial list of ailments that might require orthotics: heel pain, inflamed calluses, bunions, abnormal walking patterns (especially in children), shock absorbency, arthritis, overuse syndromes, tendonitis, and diabetic patients who require protection against open sores. Joggers, runners, athletes and people who spend a long time on their feet often benefit from orthotics. Cherrywood Foot Care has the experience and expertise to know when orthotics are the best solution for a patient’s problem. Here at Cherrywood Foot Care, we assess each patient individually to determine if an orthotic is an appropriate choice based on your specific symptoms, activities, hobbies and lifestyle. If orthotics are recommended for you, they will be uniquely fabricated for your feet following a detailed exam. We’ve learned that people’s feet can also change shape over time, so new orthotics may be required to continue treatment. We recommend that patients have their orthotics annually re-evaluated in case any minor adjustments are necessary. Sometimes, new orthotics may be necessary, but usually they’re replaced every two or three years. Devices made for children have a shorter lifetime due to the variable growth spurts that children commonly exhibit. We recommend that children who use orthotics get re-evaluated every three months to ensure that the orthotics fit properly. At Cherrywood Foot Care, we offer an extended warranty, which will cover future adjustments as well as replacements. When your devices are ready, your orthotics will be evaluated for proper fit and function. You will be instructed on the proper break-in protocol for your particular device. It usually takes two to three weeks for us to make your customized orthotics after we’ve taken an impression of your feet. The average American takes 10,000 steps a day and that can put a strain on orthotic devices. Just like a pair of shoes, orthotics wear out. They don’t last forever. Besides, you wouldn’t want them to because your own feet also change their shape over your lifetime. Periodic refurbishment, or rebuilding, of the orthotic is necessary. As time goes on, however, replacement is necessary. At Cherrywood Foot Care, orthotics are usually replaced every two to three years. Of course, we recommend customized orthotics crafted by our team of trained professionals at Cherrywood Foot Care. Yet many substitutes are sold commercially in stores, mail-order catalogs, television, and the Internet. We advise against them. These substitutes all lack several key components. None of these alternatives is based on a thorough exam of your feet, with precise biomechanical measurements and proper fitting. Most commercial devices are not even made to an exact model of your feet, and those devices that use a foam impression are not supervised by a podiatrist to make certain your foot is placed properly in the foam. Last but not least, commercially sold devices have a short longevity, forcing you to replace them often. At Cherrywood Foot Care, we stand behind our orthotics. Orthotics are an important component in the overall treatment of your condition. 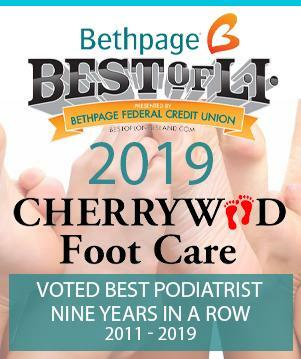 Cherrywood Foot Care‘s team of skilled podiatrists will ensure you receive detailed knowledge of your foot ailment and the treatment required to restore proper function. This expertise comes with every pair of orthotics from Cherrywood Foot Care. You won’t get this level of personal care from any store, mail order, television program or the Internet. We at Cherrywood Foot Care are happy to provide it. When your feet are happy, we’re happy.